Celebrate the occasion with a Personalised Towel or Towel Set for that very Special Wedding, Engagement or Anniversary Celebration. Personalisedbears have been supplying personalised embroidered gifts for many years and offer quality products at very affordable prices. We only use the best quality towels. Our towels are made from 100% Egyptian Cotton and have a luxurious pile and herring bone style border. They are supersoft and fluffy and come in many colours. 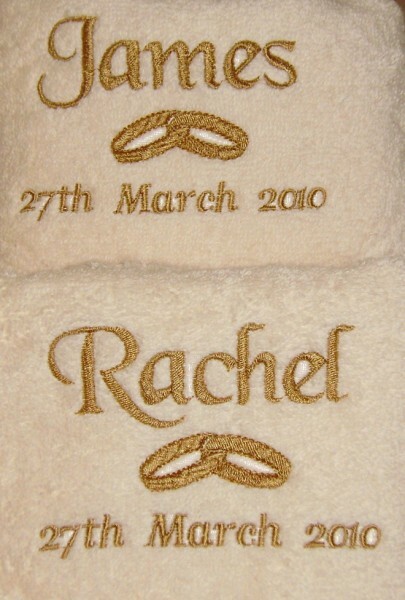 Our Personalised Embroidered Towels are made to your specifications and Gift Wrapped FREE. They come in a variety of colours and make wonderful gifts that will be treasured forever. Whether your looking for Wedding Towel Gifts, Anniversary Towel Gifts or Engagement Towel Gifts, we can supply you with that Unique Personal Gift you are looking for. ALL OF OUR TOWEL PRODUCTS ARE WRAPPED IN CLEAR CELLOPHANE WITH A BOW. TO SEE EMBROIDERY OPTIONS PLEASE CLICK ON A CATEGORY BELOW.